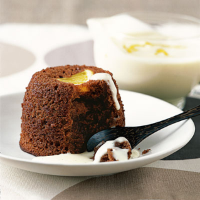 Rich and indulgent chocolate and orange sponges, served with fresh, ready-made vanilla custard subtly flavoured with zest of orange. Preheat the oven to 200°C, gas mark 6. Butter the insides of 4 x 200ml metal pudding moulds. Zest the orange and reserve. Cut a thin slice from the middle of the zested orange and juice the rest. Cut the slice into 4 pieces. Place 1 piece of orange in the base of each mould. Using an electric whisk, cream the butter and sugar in a large bowl until pale and fluffy. Add the eggs slowly and continue to whisk until well combined. Sift in the flour and cocoa powder and fold in with a metal spoon. Gently stir in half the zest and 4 tablespoons of the orange juice to form a dropping consistency. Divide the mixture equally between the moulds and smooth the tops with a teaspoon. Place in a bain marie (a deep roasting tin filled halfway with hot water) and cook for 25-30 minutes, or until the sponges have risen and are springy to the touch. Remove from the oven and allow to stand for a few minutes. Pour the custard into a small pan. Add the remaining orange zest and heat through according to pack instructions. Turn out the puddings by gently running a round-bladed knife around the edge of each sponge before tipping out of the moulds. Serve immediately with the orange custard. Serve the hot puddings with single cream, if you prefer.